November | 2011 | Small Farmers. Big Change. Today’s Morning Edition on NPR aired a three-minute story on TransFair USA’s decision to abandon the international Fair Trade system, lower standards, and at the same time, allow for the certification of plantations into their newly-launched “Fair Trade for All” initiative. The story featured Equal Exchange co-founder and co-president, Rink Dickinson. At heart is the debate about whether plantation-made products belong in the Fair Trade system or whether the original mission of Fair Trade, supporting democratic small farmer organizations should be maintained and strengthened. In the interview, Rink defends the position of Equal Exchange, other Alternative Trade Organizations, the United Students for Fair Trade, small farmer organizations, and many Fair Trade activists and members of civil society. We are united in the belief that the goal of Fair Trade is to support democratic small farmer organizations and support their efforts to gain market access, as well as to educate and engage citizens in the North who wish to use their purchasing power to create alternative business, economic, and trade models. We have a long way to go to meet this goal and we adamantly oppose TransFair USA’s unilateral and undemocratic decision to water down the Fair Trade standards and open the Fair Trade system to large plantations (who do not need market access, who already have an unfair competitive advantage over small farmer organizations, and where potential impact has never been proven). Building small farmer supply chains is hard work and requires long-term relationships, investment, patience, and skill. High-quality coffee, tea, cacao, fruit and other products are most certainly available from these organizations – that is, if deep commitment and integrity are at the core of one’s mission. Read last week’s New York Times article and yesterday’s Mother Jones article on the topic. At the end of the line is cup quality; at the beginning are coffee communities. Today, Tom Philpott, writer for Mother Jones, published an article expressing his views of TransFair’s betrayal of small farmers in the Fair Trade system. Read the short article here. Who Cares If You Buy From a Coop or Not? Pulping Stations: Being installed while we visit, these machines allow farmers access to this key equipment right in their own community, near their farm. The alternative would be to travel far (without a car, through very difficult roads) and pay someone else for the service of using their equipment. These machines mean less labor and better quality. Training: Also being debuted during our visit, the Gumutindo staff created and debuted a short video in the local language of Lugisu, outlining the best practices for each of the many steps the farmers handle: 1) harvesting, 2) eliminating defects, 3) depulping, 4) fermenting, 5) washing, 6) sorting, 7) drying. Knowing the best methods will help farmers submit even-better coffee and receive more income. Agronomists: Skilled agronomists work in each farming community, helping farmers make decisions that will improve yield, increase quality, and address challenges like pests and climatic changes. Direct Access to an International Buyer: Equal Exchange staff visits both the co-op staff and the farmers themselves. This week, we offered trainings on quality at the farm level and explained what we look for in the coffee we buy and what farmers can do to increase the amount of quality coffee they produce that will meet these standards. This trip, Beth Ann trained 20 trainers and 95 farmers. Environmental Stoves: Inspired by the women farmers she met with nine months ago, Beth Ann returned to the U.S. determined to support the women’s initiative beyond our coffee purchases. She raised money that will go toward installing 10 environmental stoves each in the Nasufwa and Buginyanya communities. These stoves will help the environment and the health of the women and their families. Direct Relationships: Gumutindo and Equal Exchange share challenges and ideas. We inspire each other. Because this isn’t simply a paper relationship, it creates opportunities we’d otherwise miss if we didn’t personally understand each other’s obstacles and potential. Women’s Empowerment: the co-op creates a structure for community dialog and leadership. In two short years, four strong women’s groups have emerged and are growing. Five of the nine Gumutindo board members are women! Youth Staying in Coffee: Co-op support helps to keep coffee farming a viable livelihood option for current farmers and their children. The co-op has just hired about 20 managers (local men and women) who are now living and working with the farmers in their communities. The co-op purposely sought out recent college-educated graduates to bring additional business skills back to the farming communities. This also created an opportunity for young people to return to work in rural communities instead of essentially exporting their skills only to jobs in the cities. There are a lot of different types of trade models out there these days, touting this or that. Why does Equal Exchange insist on buying only from small farmer co-ops? (After all, it might be trendier or easier if we did something else.) We’re thinking big and want to change the whole way consumers and farmers connect! Sometimes that means I talk about things like systemic change and infrastructure, and while those things are actually true, those words don’t convey the passion and the creativity of the changes that are actually happening on the ground. So many of these things are happening in our network that it’s hard to summarize them. So instead, I’m not summarizing; the list above is what I see with my own experience on the ground, that the co-op commitment supports in one co-op in Uganda. 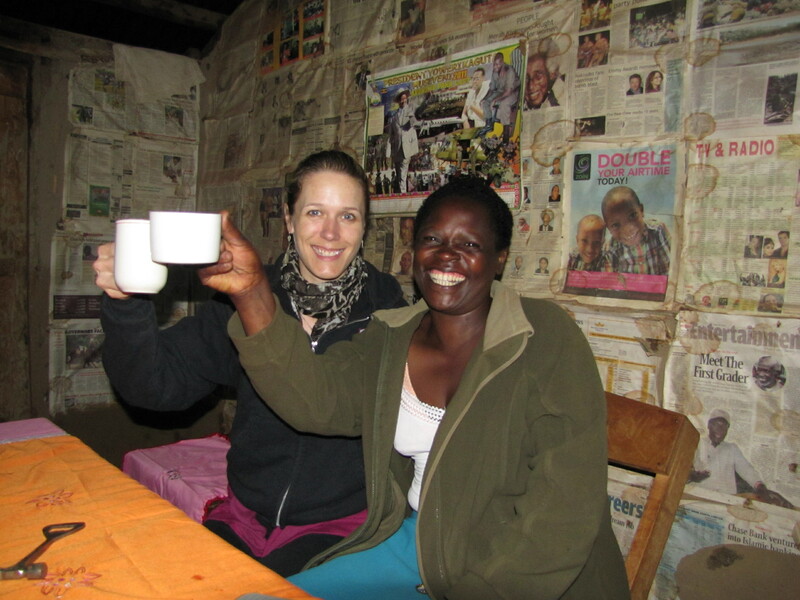 For more stories about Beth Ann and Lynsey’s trip to Uganda, click here. We just got back from doing a one-of-a-kind training with small farmers in Uganda. … like you’re right there with us. Click here. Fair Enough Trade For All? The criticisms over TransFair USA’s recent (and not-so-recent) attitudes and actions are mounting. I’ve been having recurring nightmares about Fair Trade USA. In the last year the bad dreams keep getting scarier and scarier. Read the rest of their commentary here.